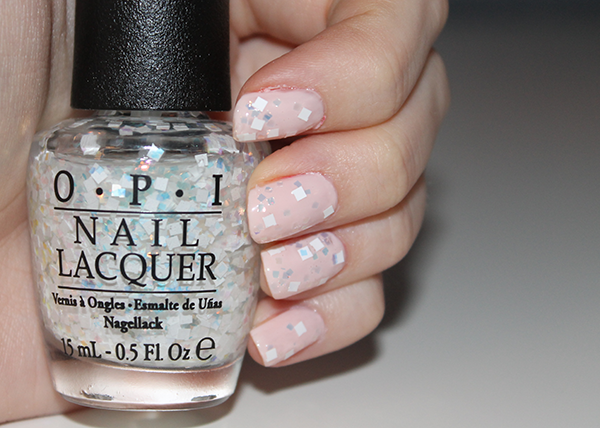 OPI have recently came out with their newest collection, in association with the new movie Oz The Great and Powerful. I haven’t seen the movie yet but I had to get my hands on some of the nail polishes as soon as I could. There are 7 new shades in the limited edition collection which mostly consists of earthy shades, pinks, glitter and a hint of dark glitter to represent the good witch/bad witch. I restrained myself and picked up 2 shades from the collection, Lights of Emerald City and Which is Which. Both are glitter top coats and apply really well on the nails. I decided not to purchase any of the colour shades because I have similar shades already and the OPI brushes are a little hard to use on my tiny nails at the best of times! Lights of Emerald City is unlike any other glitter polishes I own. It has a mix of square white glitter and a hint of blue round glitter inside which makes it perfect for applying over soft colours. I think this looks best over pastel shades in my opinion, this time I applied it over Essie Muchi Muchi. If you don’t want full on dramatic glitter nails like I have here, it’s also really lovely as a feature on your ring finger nail. It can be a little tricky to position the square glitter so I’d suggest as little product on the brush when applying it and try to place the glitter onto the nail then going over it with a top coat. Which is Which is more like your traditional glitter nail polish. I find this polish a lot more subtle than the previous one as the glitter is so fine so I think it could be used over a wide variety of colours, maybe even a dark blue shade? I like that it has strips of glitter too and it’s not all rounded which makes it a little different. This one is also a little easier to apply than the previous polish as you don't have to worry too much about where the glitter is positioned. Will you be picking up any nail polishes from the collection? Let me know what you think of them! They both look lovely over the Essie muchi muchi! my favourite is lights of emerald city!